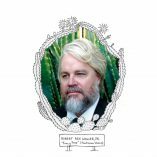 Admittedly unfamiliar with Robert Rex Waller, Jr., or his popular roots-rock band I See Hawks in L.A., something about Waller’s cactus-framed face on the cover of his solo debut album Fancy Free seemed to grab my attention. He was a cross between Philip Seymour Hoffman and Kenny Rogers. A classic sort of look, particularly with that “Memphis hair,” as Waller calls it. There is a sad, Woody Guthrie feel about this opening track, which is enhanced by Waller’s authentic voice and the violin of Nora Germain and his father, Robert Rex Waller, Sr.’s piano. Like the old hobo train songs of 80 years ago. Neil Young’s “Albuquerque” (originally appearing on 1975’s grief-stricken Tonight’s The Night) gets the Waller treatment. As he sings the line “So I’ll stop when I can / Find some fried eggs and country ham / Oh, I’ll find somewhere where no one cares who I am,” you sense the road-weary doomy-ness of it all, even amidst the accordion flourishes, courtesy of Grammy Award-winning accordionist Joel Guzman. While there is nothing remarkably innovative in his treatment of Daniel Johnston’s “Don’t Let The Sun Go Down on Your Grievances,” which is one “side A” of the CD (? ), it’s the cover material on “side B” that really grabbed my attention, from Willie Nelson’s “Me and Paul” and a particularly dreamy cover of The Hollies’ 1974 hit “The Air That I Breathe,” a song written by Albert Hammond. I actually got chills listening to this one. The drummer on this one is clearly being given license to have fun with it. I suspect Hollie Bobby Elliott would give Waller’s session drummer a thumbs-up. And you know, Waller pulls off a pretty damn good cover of The Doors’ psychedelic number “The Crystal Ship.” And I thought only Echo & The Bunnymen could perform such a musical trick. Good on him! And I’m also sure Mrs. Waller would smile, knowing that it was her son’s own risk-taking writing students who inspired to take break out and record this fine solo album. One other thing. If noted music archivist T-Bone Burnett is looking for someone to include on his next roots-music-heavy film project, I hope he has Waller on speed dial.